According to the Center for the Digital Future at USC Annenberg and ThePostGame, 63% of all sports fans are interested in paying for an all-sports over-the-top channel. Of those interested in streaming sports, 56% would pay more for online streaming than for traditional TV channels. In households with children that number jumps to 70%, or 78% for people who self-report as “intense” sports fans. “Sports is the last category of must-see-now content,” Jeffrey Cole, founder and director of the Center for the Digital Future told Broadcasting & Cable in an interview. 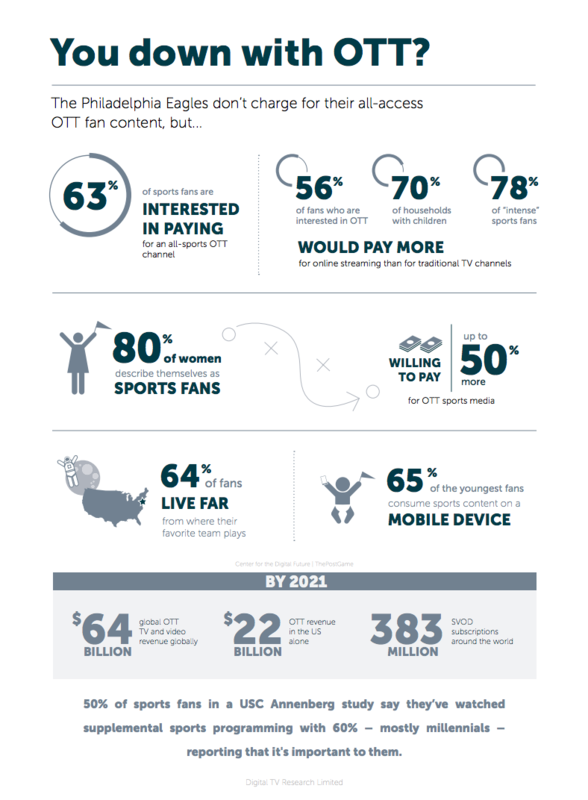 “Based on our data, Gen Z and Millennial fans are clearly shifting preferences, behavior and spending.” Another interesting stat from this study: 80% of women describe themselves as sports fans and are willing to pay up to 50% more for OTT sports media content. Another validation of the Philadelphia Eagles strategy: 50% of sports fans in the USC Annenberg study say they’ve watched supplemental sports programming with 60% – mostly millennials – reporting that it’s important to them. By most forecasts, OTT is poised for massive growth over the next five years. London-based Digital TV Research Limited predicts that global OTT TV and video revenue will reach $64.8 billion globally by 2021. In the US alone, OTT revenue will increase to $22.8 billion in 2021. Digital TV Research Limited also estimates 383 million SVOD subscriptions around the world by 2021. How the Philadelphia Eagles develop broadcast-quality live video for over 2M viewers. Data and statistics on rising interest in sports on-demand content. The equipment and tools the Eagles use to connect to fans with live video.